The speed a website loads in is important. This is both from a search engine optimisation (SEO) point of view, but also for the best user experience. According to statistics, 53% of visitors abandon a site if it takes more than 3-seconds to load. A key hurdle that a client often faces when adding new content to their site (i.e. a blog or news post) is keeping image sizes small, and how to achieve this. 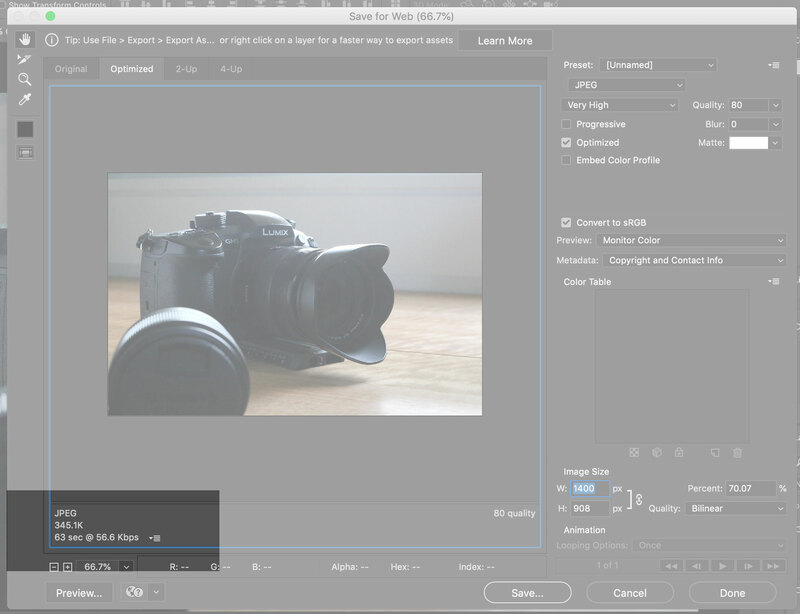 This tutorial runs through the process I undertake for optimising images for a website. What's an ideal file size? An image file should be less than 500 KB for the best results, however - the lower the better, as long as the quality of the image isn't affected. You can check the file size of your image by clicking on it on your computer and viewing it's properties. If you're a client of Domin8 Designs and uploading an image to your website, Webflow displays the file size for you and will often flag if it's too big. Domin8 Designs client's can see an image file size when uploaded. This is quite a specific process as I'm an Apple user, however hopefully there are some tips in here that help. Firstly, I consider if the image is going to be used on the header of website, as a thumbnail for a blog post or generally through out the website etc. It helps inform the dimensions for the optimised image. For example, if the image used for the header of a website is optimised to be really small, then it will appear pixelated and blurry. Similarly, if a smaller image such as a blog thumbnail is 5000px wide when on the actual site it will only be displayed at around 500px, then the file size will be unnecessarily big. Summary - Consider where the image will be used on your website to scale it accordingly. A maximum size I use is ~1,800px wide, but smaller images should be around 1,000px max. This step requires Adobe Photoshop, which I know isn't accessible to everyone. The premise of this step is to 1) use the "Save For Web" feature to make the image size smaller and 2) change the dimensions as per Step 1. You may be able to use your favourite image editing application to change the dimensions of the image. You can then skip to Step 3 which may still help! Step 2A: start by opening up your image as normal then going File > Export > Save For Web. This will open a new dialogue box (see the images below) which is specific for saving optimised images. Step 2D: Checking the file size. 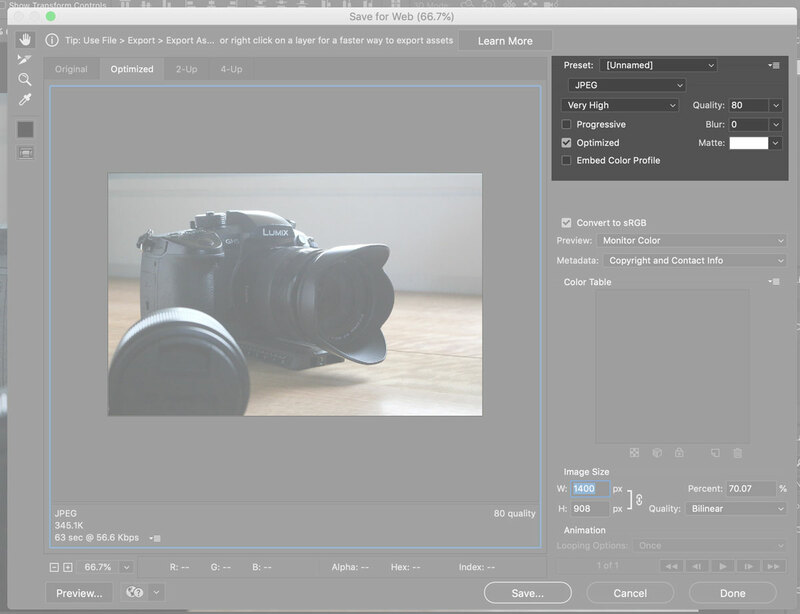 Change the preset to JPEG High and edit the quality if required. 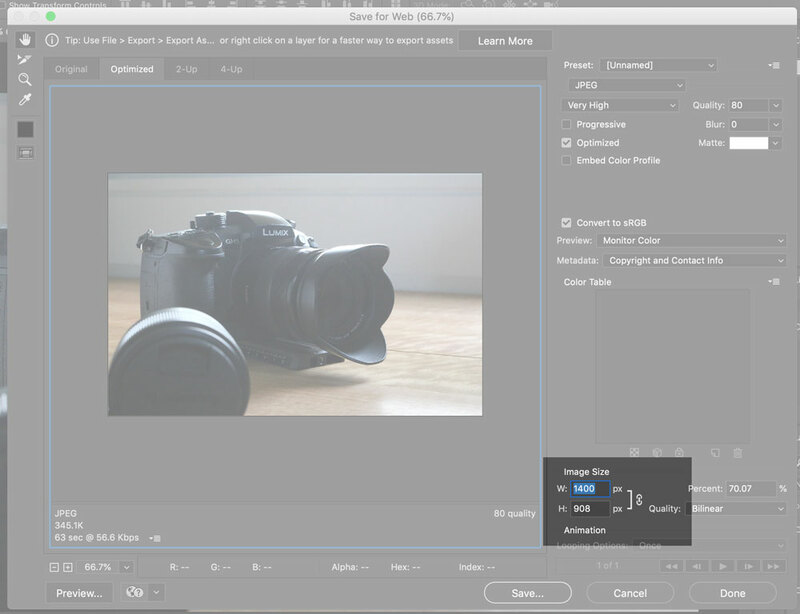 Edit the image dimensions (as per step 1 of this tip) to an appropriate amount. Check the approximate new file size is below the 500 KB mark. Once done, hit the "Save..." button and save the optimised file to an appropriate location. Here, I run the optimised photo through a program called ImageOptim (Mac only, see here for proposed alternatives) for further optimisation. If you're not a Mac user or don't do this regularly, then I'd recommend the online website Compressor.io, where you can upload your file and re-download a compressed version. ImageOptim users can drop and drag multiple files in and it'll process them all at once. It also re-writes the original file, so there's no need to save again. 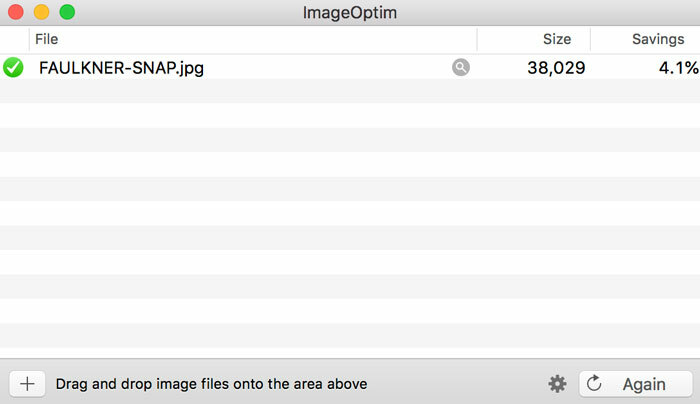 ImageOptim is great for a final compression of your optimised image. Once you've performed the steps above, I always double check the final file to ensure the quality is still acceptable as well as the size. If you're happy with the newly optimised image, you can upload it to your website and enjoy a faster load speed. As an example, the image used in this tutorial started off at 4 MB, and was reduced down to below 200K using the methods above. If you times this by 3, 5, 10 images per page, per website, that's a significant amount of download required and therefore speed saved on. I hope this quick tip helps both clients of Domin8 Designs and those who manage their own website alike to upload optimised images.